Yadav also demanded a quota for the OBCs in private sector jobs and called for agitation to change the government's stance on the same. 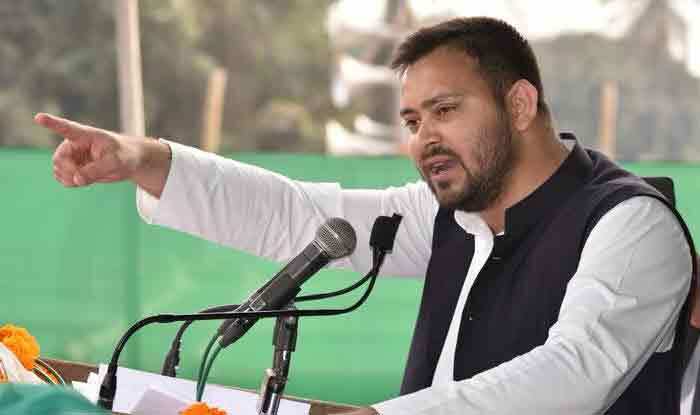 New Delhi: Rashtriya Janata Dal (RJD) leader Tejashwi Yadav said that his party will raise its voice against the Centre’s move of granting 10 per cent quota to general category poor and demanded at least 40 per cent quota from the existing 27 per cent for the Other Backward Classes (OBCs). He also demanded a quota for the OBCs in private sector jobs and called for agitation to change the government’s stance on the same. Yadav call for agitation came on the occasion of Karpoori Jayanti which is celebrated on January 24 in the state and holds significance in the light of the reservation issue. Bihar Chief Minister Nitish Kumar who had earlier decided to roll out the 10 per cent quota to the poor in the general category by introducing a separate bill in the state legislature’s budget session next month, too spoke of the reservation in Bihar by Karpoori Thakur Ji on the leader’s Jayanti. Kumar said it wanted the Centre to give reservation as per the division made by Karpoori Thakur — that is, extremely backward and backward class. Demanding that a caste-based census is done, Kumar said it’ll help clear the situation regarding the reservation issue as the population of scheduled tribes/castes and backward classes have increased but the limit is 50 per cent. Karpoori Jayanti is celebrated to commemorate Karpoori Thakur who was the former Bihar chief minister and a socialist leader. Known as Jan Nayak, he introduced reservation for the backward classes in the Government jobs, in 1978 and is known for his interesting formula for quota, which had a share for the poor among the backward classes known as EBC (Economically Backward Class). Notably, there was three per cent quota for the poor among the upper castes also. Thakur was also a mentor to Lalu Prasad Yadav, Mulayam Singh Yadav and Ram Vilas Paswan. Questioning the move to introduce a 10 per cent quota for the economically poor among the upper caste and terming it as a hasty decision, Yadav said he wished to know from the government how can a person earning Rs 8 lakh a year be considered poor. Yadav said, “You tell me how can someone earning Rs 8 lakh a year be called poor. It means the person is earning Rs 66,666 a month, can he really be called poor. It’s strange mathematics. It also means that the person is paying a 20 per cent tax on the same which amounts to Rs 72,500 a year. The person who can pay Rs 72,500 as a tax is being given reservation by this government. Hail the intellectuals, Hail Modi,” Tejashwi tweeted. On Wednesday, the RJD leader added the new reservation would backfire on BJP because the Bahujan (majority communities) are feeling cheated by it. “This move by the Narendra Modi government is as thoughtless as demonetisation. BJP will have to bear its consequences,” he said.